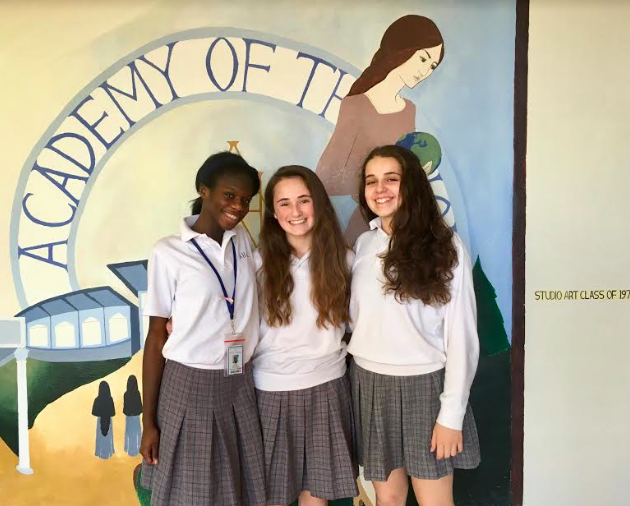 The Academy of the Holy Angels in Demarest, NJ has selected Kayla Pringle of Suffern and Angelina Busetto of Pomona as representatives to the 2018 Hugh O’Brian Youth Leadership Seminar. Morgan Morrissey of Saddle River is AHA’s alternate representative. The seminar is for high school sophomores who demonstrate a talent for leadership. The representatives were chosen following a highly competitive selection process. In addition to being named a HOBY representative, Pringle has been accepted into the Teen Leadership in Rockland program through Cornell University. She is involved in numerous activities at AHA, including fencing, Animal Rights Committee, Society of Women Engineers, Angels Enable, JOY (Joining Old and Young), Black and Hispanic Cultural Society, Robotics Club, and Dean’s Council. She is also a member of the Tri-M Honor Society for musicians. Busetto’s many activities include Debate Team, Model UN, Academy Orchestra, Project Greenhouse, Robotics Club, Forensics Club, and Powerback Club. She is also involved with Student Council, where she is currently president of the sophomore class. Within her community, Busetto is an altar server at Our Lady of Mercy, where she has also participated in Summer Vacation Bible School, Family Promise Homeless Shelter, and Covenant House Cardboard City Sleep Out. Morrissey is a member of Student Council, the Academy Orchestra, Operation Smile, Model UN, Middle States Planning Team, AHA Voice, and Debate Team. She volunteers as a peer tutor, plays tennis during the fall and is a writer for Saddle River Magazine. She recently earned a ninth place finish on the National French Exam. This June, student leaders from around the country will attend the 2018 Hugh O’Brian Youth Leadership Seminar at Kean University. Founded by the School Sisters of Notre Dame in 1879, the Academy of the Holy Angels is the oldest private girls’ school in Bergen County.